Not too long ago, I had the opportunity to experiment with Sciton’s Profractional Laser Technology, Sciton’s BBL, and Sciton’s MicroLaserPeel treatment. I was pretty excited about the versatility of the MicroLaserPeel. This resurfacing laser treatment is fully customizable, and can fall anywhere in social downtime (ie, pinkness/sensitivity afterwards) between a REALLY effective microdermabrasion and a huge, intense laser treatment. Almost any skin areas can be treated, but the most popular treatment areas are the face, neck, chest and hands. MicroLaserPeel (also sometimes called a NanoPeel, or a Weekend Peel) is an erbium laser treatment that removes a thin layer of damaged skin to improve texture and provide a more youthful appearance. It’s pretty great because it can be administered with great precision of depth, like if you only have one afternoon for social-downtime. The procedure is performed in your physician’s office and is pretty great because it can be custom tailored to your specific skin concerns, and most importantly: How much time you have to spare for social downtime. That, and it can be combined with other laser procedures at the same visit to maximize your results. The depth is measured in microns, so a 10 Micron laser Peel is much lighter than a 20, which would require some social downtime. Here’s how you could look at it: A series of microdermabrasions (like maybe 6 treatments) can equal one treatment of a 10 micron MicroLaserPeel. Here’s a great video of a demonstration.You’ll see the MicroLaserPeel’s beam being scanned over a treatment area to remove the very thin layer of the skin. As the skin heals, fresh cells grow and resurface the treated area. The result is healthier-looking skin, often with reduced wrinkles and improved tone. Patients often say that it looks like their skin went from looking ‘tired’ to fab. 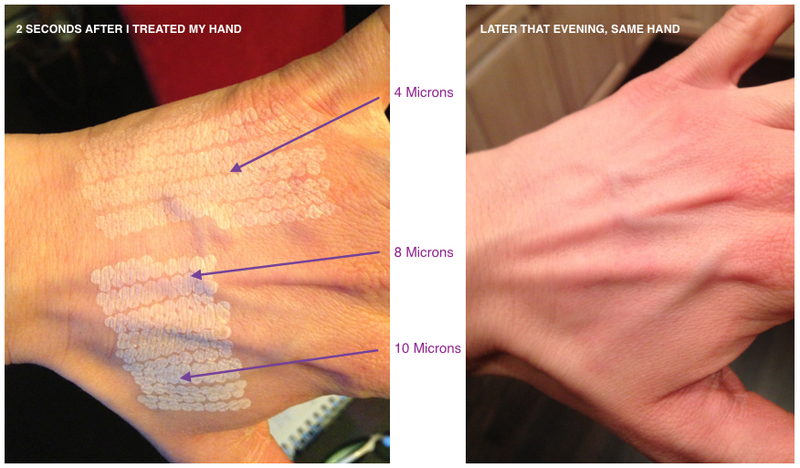 I felt totally fine (no discomfort AT ALL), and the texture on my left hand actually looked and felt smoother and healthier than the right hand, almost right away. I was surprised how audible the laser sound was, and how comfortable it was. I really didn’t feel much at all! Can’t wait to offer this treatment to our patients, I think they’ll love it! Until Next time: Stay fabulous My Friends!